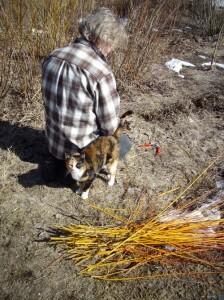 Each spring, as soon as the snow melts in the garden, and before bud break, there is a very short window to harvest willow rods for basket weaving. The willow rods are cut at the base of each rod, one at a time. A mature willow stool will have any where from 20 to 40 long straight rods, ready to harvest in the spring. You can use the rods for weaving willow baskets, for making living willow sculptures, or for making a wattle fence or other garden structures. You can also use the rods to make willow cuttings, in order to expand your basket willow plantation. If you miss this narrow window, you are best to leave the willow stools for another season. The rods will grow taller and thicker and branch near the top and you can use them for willow furniture. Not all kinds of willow do well when coppiced. You want to use fast growing, basket willow types for coppicing. These respond well to having their rods cut back each Spring. They will form a large, willow stool that stores nutrients in the root zone to give off strong growth in the Spring of many new rods. First sharpen your pruning shears. Dull pruning shears will bend the branch and allow disease to enter into the damaged bark. Always use clean, sharp pruning shears when harvesting willow rods. Cut the rod at the base of each rod, without cutting into the hard willow stool. Gather the willow rods and bundle them with the cut end together. Allow willow rods to dry before weaving them into a basket. 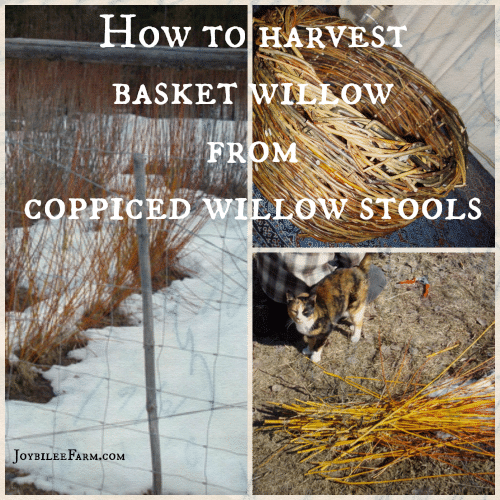 You will need 3 to 5 willow stools, with20 to 30 rods each, to weave one medium basket. You’ll want to plan this into your willow garden. I took this short video for you to see the techniques that we use at Joybilee Farm to harvest our willow rods. I hope you enjoy it and have more confidence to get out your pruning shears, for many years of enjoyable basket weaving. Its way more fun to grow your own baskets! After you harvest your basket willow rods, you’ll want to take the shorter rods or the misshapen rods and peel them for medicine. Willow bark is easiest to peel in the spring just as the sap begins to rise and the colour comes on the previous year’s growth. 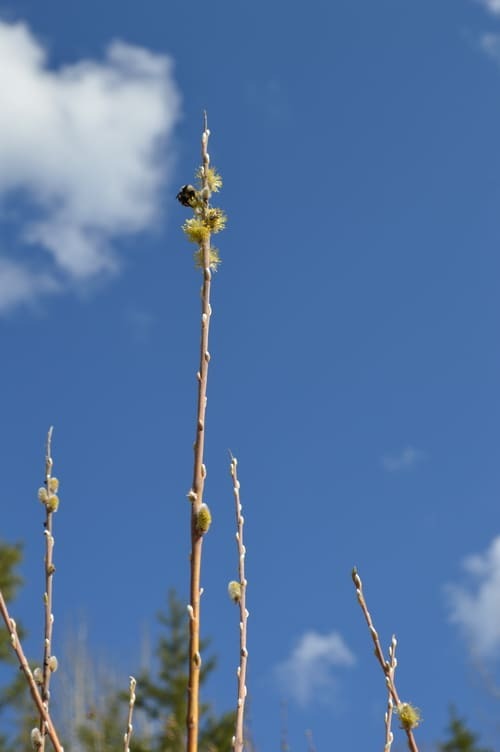 Find out more about using willow bark for herbal medicine. Hi. My mum had a mature willow cut in her garden in autumn and I’ve just started cutting and bundling the different size growth in the hope I can use for various projects. I was wondering how long I can store them before using, I.e. will they still beuseable in a years time if I soak them? Thanks! : ( The video doesn’t appear on my screen….? A vine maple? You should be able to coppice it as well. But I don’t have experience with coppicing Acer trees. This article may be of interest to you.